How do you apply the learning from your regrets to your actions today? I wanted to write more from the soul since my last update was sincerely a wake-up call. So here it is, busting deep into my mind to pry on such a magnetic topic. Here we are again with another topic from my very own writing challenge. What is regret? Let's quote Wikipedia, shall we? Regret is a negative conscious and emotional reaction to personal past acts and behaviors. Regret is often a feeling of sadness, shame, embarrassment, depression, annoyance, or guilt after one acts in a manner and later wishes not to have done so. I don't do regret. I never regret anything. It is a bold statement, but I want that to be me. I have just lived for 23 years old. More things would happen and you guys might say I would surely have something to regret on then, but still, I don't want to regret a thing. I believe in Allah. I believe He had settled more than simply what my mistakes might show. I believe in not showing regrets because I want Him to know that I trust Him and that He would never do a wrong choice. Frankly speaking, that itself has given me a tremendous peace of mind. I believe in not regretting and just accepting as it would eventually be a cause for a better reward in the afterlife. I am flawed and that have led me to some dreadful choices. I know I am made of imperfections, but I never regret them. 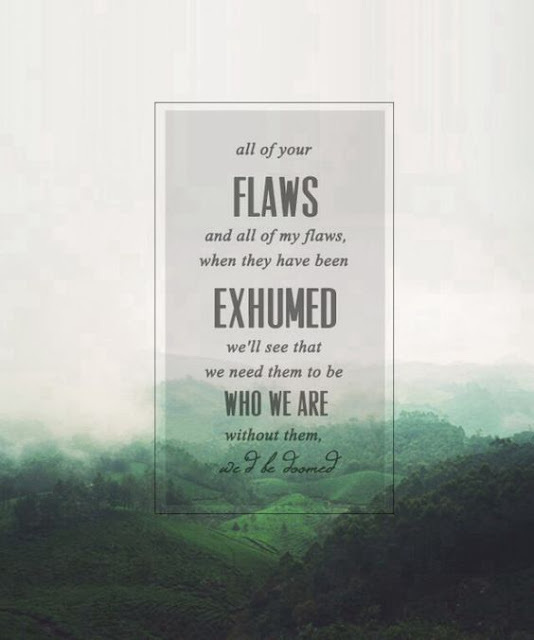 I am proud for all those flaws! I am flawed but made no regrets. Over the years, I have realized I change. For the better part of me, I change, ever so slowly but yet a sure act. Splendidly, my flaws which some choose to regret over have led the most of my changes. It teaches me experiences and builds me strength. It showed me someone who I never thought I would be. Someone I needed to be. It gives me a better perspective on life and even made me believe in myself; body and soul. 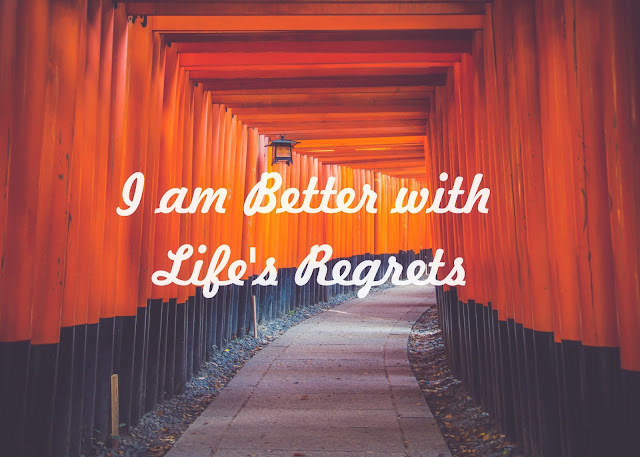 There are some past acts and behaviors of mine that some might see it as things qualified to be regretting over. I think the biggest one should be regarding losing my mother. I know I should treat my mother better when she was alive. Show her that I love her so much and that no one can replace her. Talk more with her, hug her, smile to her, made her smile. There are tons of things but should I regret that I did not get to do all those things? No. The most important thing is that it has taught me to appreciate "the now" more than ever and always knows that every person has their own suffering. 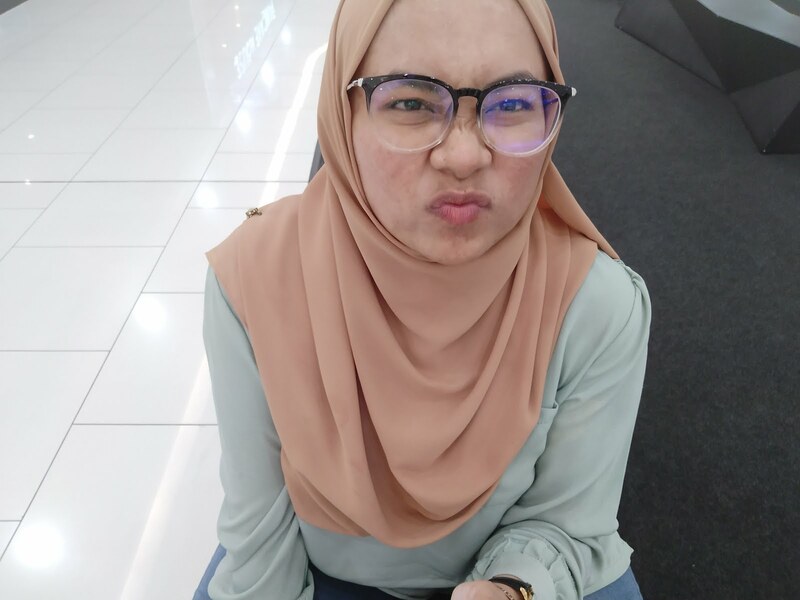 I now learned that the best way I could love her more is to pray for her and to improve myself so that I can become that "solehah" kid. I have been into a terrible car accident and it was purely my mistake. I have been depressing over it and thought the worst out of me when my friends have always trusted me. I should drive slower, be patient, don't feel too pressured to show that I can drive better, should trust my instinct more yada yada. Name it all. There surely lots of reason to regret such that I can actually prevent that. But guess what, when Allah wills it, who am I to "prepare" to not letting it happen? I always know I can get a good result if I study better. I should use my time wiser and push myself more. It is important since the good result can secure me better chances for a job. But here am I now, already graduated, with a so-so result. What can even happen if I regret that I am not that smart kid? That is kinda the ultimate question huh? Should I re-study? Hell NO. There are other things I can do now to help me than wasting my time on regrets. Regrets took a lot. Not only your time but your passion, your willpower and most importantly, your trust towards yourself. All the "if" is just too much. So I choose not to regret but took action onto not letting it happen again. That those things happen because it has to happen to make me who I am today. A better person. When you start looking over the regrets, you can see how much you can break and just how much you can push yourself. When you stop to look for regrets, you will see that you are your own master and fear would not dictate you anymore. There are a lot of things that I regretted doing especially in high school but I guess it kinda helped to be better. i like this! instead of regretting, find better things. yeah! you can dear, start by stopping saying that you can't. it wont magically happen in a night but the little mental note will help you slowly.